Fixes Milo, shipping foreman, in Nuka-Cola Factory so he challenges player regardless of status of Nuka-Cola Challenge quest. This is a fairly simple mod. If you wish to improve upon it or incorporate it into another mod just ask so I know. This is now included in the UPDATED Unofficial Fallout 3 Patch version 1.9.1+ so no need to download it separately if using UUFO3P (highly recommended). Milo (the Mr. Handy shipping foreman in the Nuka-Cola plant) will only speak his unique dialogue if the "Nuka-Cola Challenge" quest is active (and even then sometimes not due to bugs). This doesn't make much sense. What if you complete that quest (or haven't started it) before encountering him? Why wouldn't he still challenge your character being there? 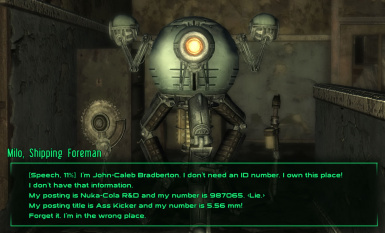 This mod addresses that by making his unique dialogue available no matter what (though some dialogue options are only available depending on the status of the quest). This does not address all the issues with the unmarked quest "Just for the Taste of It." It simply makes the dialogue with Milo available if appropriate. This is very much a beta mod! Although I have tested it quite a bit on my own game and I don't see how it can break anything, I am still not willing to claim it is 100% bug-free. Please let me know here if you have any problems. Also, if anyone is interested in non-English translations I should be able to make those fairly easily. I will just need to get the resources from the game files in those languages. Makes all of Milo's dialogue available at all times, except as mentioned below. Changes generic Mr. Handy greetings ("What is it now, Sir/Madam?") so they exclude Milo. Changes Milo's dialogue to always check both your number of demerits and whether you have ID'ed yourself where appropriate. Previously, you would occasionally encounter a bug where he would give improper dialogue, such as acting like you hadn't identified yourself when you had, or not attacking you even though you had more than 2 demerits. Set so you can only ask about Nuka-Cola Quantum if you have started (or completed) "Nuka-Cola Challenge." Changed demerit checks to fix several bugs. For example: in vanilla, if you obtain one demerit, then choose the option which gives you an automatic two more demerits, Milo wouldn't attack right away (as he should according to his dialogue). Changed the condition for asking for research safe key from checking whether you had found Mercier to checking that you have the "Finding the formula" note. This is same as how UFP handles this check, so this should be compatible with UFP. It is highly recommended that you use Fallout Mod Manager to install (should work with NMM also, but I haven't tested). Alternately, however, you could open the 7z file with an archive utility such as PeaZip and copy both the .ESP and the "Sounds" folder to your Fallout 3 data folder. Deactivate normally with FOMM, or if you installed manually, delete MiloDialogueFix.esp and all the LIP/OGG files this installed. Should be compatible with any mod that doesn't alter Milo's dialogue or the two default greetings for Mr. Handy robots. I created it while using UFP mentioned above so I know it works with that. Just make sure it is loaded after UFP (which it should be since all ESPs load after ESMs). Most users can ignore this section. I am including it mainly for modders. All of Milo's dialogue entries have had their quests changed from "MS05 'The Nuka-Cola Challenge'" to "GenericRobot." This doesn't seem to break anything so long as all the conditions are correct. In fact, the variables associated with that quest are still able to be read and set when the quest is marked as complete. Because the associated quest has been changed, I had to extract and rename all the LIP and OGG files to match in order not to lose voiced dialogue. In order to prevent the default Mr. Handy greetings from ever taking priority for Milo, I added a condition to both to exclude his character. Even after giving Milo a proper ID (either by having found the note or passing speech/perk check) Milo would still act like he didn't know you if you talked to him a second time. I fixed this by adding a condition to that dialogue to make sure the "MS05.ID" variable was not set. Not sure if this was a vanilla bug or something caused by the other changes I made. Made sure you couldn't ask about Nuka-Cola Quantum or shipping manifests unless "The Nuka-Cola Challenge" has at least been started (or completed) by adding conditions to both. Originally, the option to use profanity was kind of bugged. Although it gives you two demerits, the condition only checks whether you had two demerits previously. So if you had only one, Milo wouldn't attack even though he should always attack when you accumulate 3+ demerits. So I changed the condition for this option so Milo would attack if you even had one demerit before choosing it.